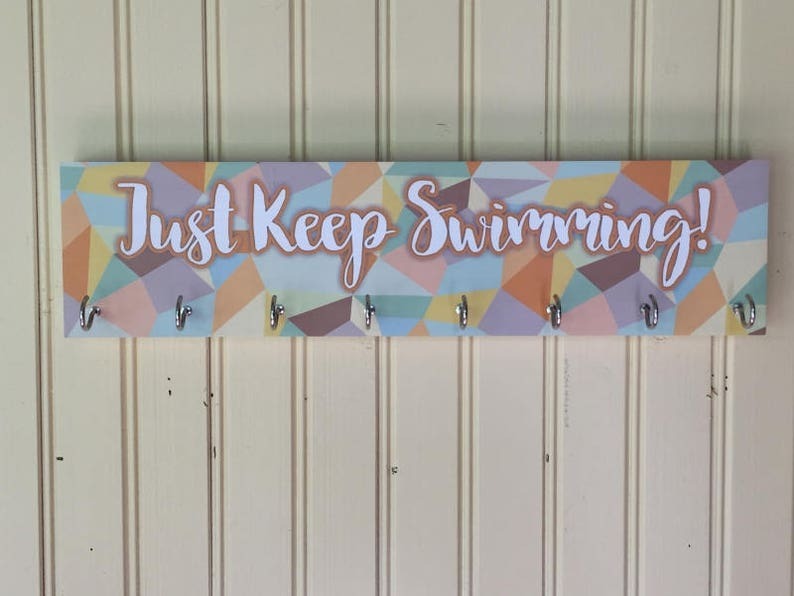 This beautiful wood sign with the words "Just Keep Swimming" is just what your swimmer needs to get those ribbons and medals on display. Solid pine wood sign with hooks for hanging medals, ribbons & awards. - If you are looking for a custom design, statement, name, size, shape, etc., please use the "Request Custom Item" option on the left side of the store page. **LOOK, THIS IS NEW! ** Add a note to the back of your display. Add the below listing to your order. Thanks for you for visiting! ALL DESIGNS ARE COPYRIGHTED PROPERTY. © Ambo Design & PeaceLoveSwim.com. All Rights Reserved. We use brown kraft paper with a simple twine bow to wrap your items! I ordered these as gifts for my family and they came out beautiful! Would definitely recommend. It's my second time ordering from here. Always perfect quality and colors! About to order another one for my son! Very nice board but the spacing between the hooks is too small to fit the swimmer ribbons, so they overlap when hung. Board needs to be longer to accommodate the typical award ribbons. Please use Etsy Direct Checkout or PayPal upon ordering to ensure prompt shipment of your order. Please contact us with any issues. If your item is defective we will replace it with an identical item. Notification must be received within 2 days of receipt of damaged item(s). We may request photographic evidence including packaging for insurance claims so please do not throw anything away. Due to all items being custom made-to-order, we do not offer cancellations, refunds or exchanges. All items are made to order. Please allow anywhere from 5-14 business days for items to ship. You will receive notice via e-mail when we send them out. - Yes, we do produce custom orders as needed. You may click on the custom item request or contact us through Etsy conversations with any questions. - Everything we make is a one-off item with unique characteristics including wood grain, rough textures and imperfections. Please be aware that we try hard to make sure everything on the natural products avoid strangely placed imperfections, but they are possible. We do not replace these items as they are made as intended.